"Thank you for your email. 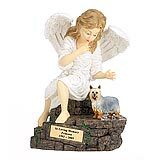 The urn is perfect, and will have an honored place in our home always. Thank you for providing a product that is accurately portrayed on your website." 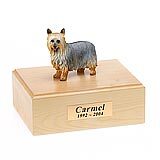 All available Silky Terrier dog urns and memorials will be displayed with the figurine on the Silky Terrier urn you select and in the appropriate size.